Journey through Prince William Sound and come face-to-face with the Columbia Glacier—one of the world’s fastest-moving glaciers and the last tidewater glacier in North America. Your adventure begins on a scenic drive through Thompson Pass, once used by Alaska’s Native Ahtna people and later by Klondike gold rush miners. 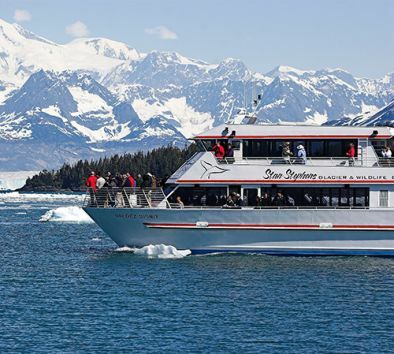 You’ll continue on through beautiful miles of green forested hillsides to the town of Valdez where you’ll embark on your Columbia Glacier cruise. In addition to the amazing ice in Columbia Bay, you’ll see wildlife that call the sound home and have the opportunity to learn about the mining, oil shipping, earthquake, and fishing history of the area. Dress in warm layers. Bring a camera. Restroom facilities are on board. Wildlife sightings are likely but not guaranteed. Please be advised if your cruisetour itinerary includes a catamaran transfer from Whittier to Valdez, or Valdez to Whittier, that you may see similar scenery. Travel time is approximately 2 hours each way.